I was one of many who was disappointed to hear that some features from the new Apple TV would not necessarily be ported to the previous version. Most notably for me was Netflix streaming. So if I do upgrade to the new $99 version, what to do with my current model? I decided to make it the media server that I always wanted. Why not? It has a 160 GB hard drive, is WiFi network saavy, and has a remote control. Once I set it up, I don't even need the HDTV interface anymore because I can control its operations from my iPad or iPhone via the Remote app. 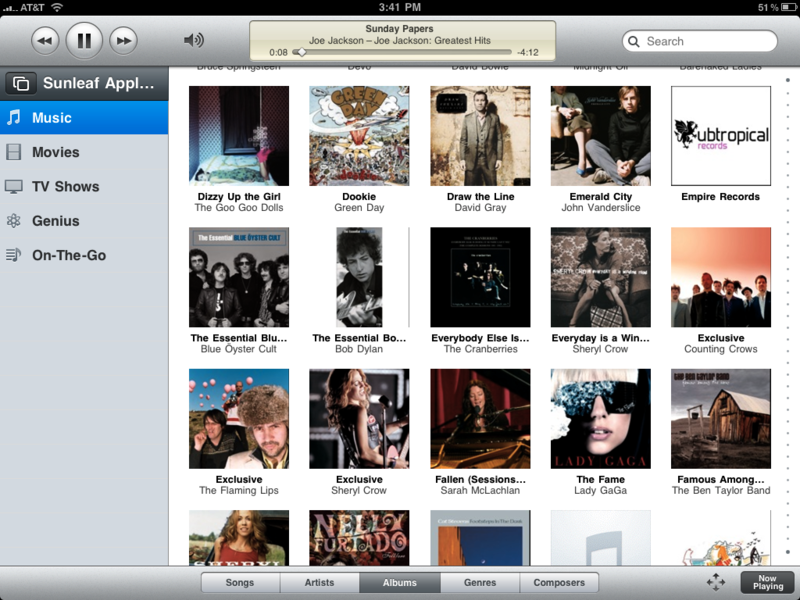 So I set about copying 2,430 songs from my iTunes library to the old Apple TV. This was easily handled in iTunes, which is synced to the Apple TV. Then I downloaded the latest version of Remote for the iPad. It provides the graphical interface I need for controlling the Apple TV, including controlling the speakers on my AirPort network throughout the studio. Remote app on the iPad controlling my Apple TV "media server". Click on image for larger view. 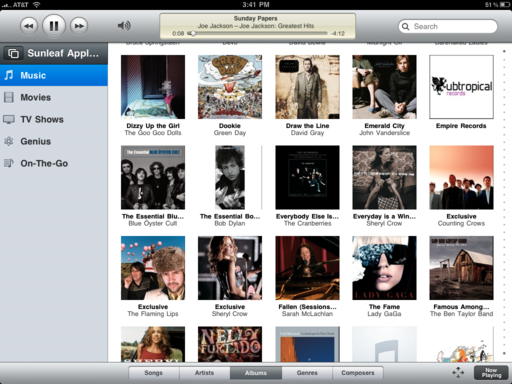 If I need to update the content on the Apple TV, I can just move songs from my iTunes library. It's all handled easily and without wires. And like I said, once everything is set up, you don't even have to turn on the HDTV. Apple TV will stream music throughout your network using the iPhone or iPad as the controller. So the question is, can you access the media on the old apple tv from within the new apple tv? I wanted to do this also, but for some reason - I do not have syncing available. I did when I first bought it, but after some update a couple of years ago - it disappeared. Did you ever hear of that? In response to Todd's question, you cannot access content on an old Apple TV on the new Apple TV. Apple TV gen 2 may be linked to other computers on your home network that are running iTunes, but not the first generation Apple TV. Nevermind my comment, I just spent the last hour looking into this and finally found my problem. It did not have my library as a primary library. It was a secondary library, which only streams. In general, wHen setting up the Apple TV, you have to initiate the sync to your iTunes library from the Apple TV, then copy content to it's hard drive. Once you do that, it can work on it's own. You could also purchase aTV Flash which can really expand your Apple TV in to a full fledged media server and you can still use your iPad as the remote. I have been using it for a while, with my iPhone. With aTV Flash the old Apple TV is much better than Apple's newest model. Old apple TV was better IMO, the new one is buggy as heck. I had trouble getting all my old data back to the new Apple TV and it wouldn't transfer correctly either. I ended up having to reset everything and try at least 2-3 times before I got the transfer working, about 95% in it crashed!